The Shetland Sheepdog, often known as the Sheltie and sometimes as the Shetland Collie, is a breed of dog in the pastoral dog group, resembling a miniature Rough Collie. Shelties are family-oriented dogs that can be as at home in a flat in a town as in a house in the country. They have a thick double coat that can come in many different colours and patterns. They are vocal dogs, with few health problems; among those they are prone to are hip dysplasia and thyroid problems. They are very good house and family dogs. A sheltie is very protective and good with children if properly socialised with them while it is a puppy. 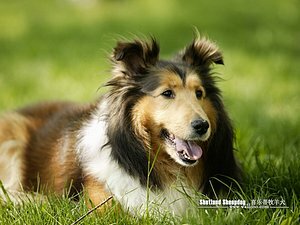 Despite its name the Shetland Sheepdog is only remotely connected with the original herding dog of the Shetland Isles, instead deriving mainly from a mixture of the Rough Collie with several toy breeds.